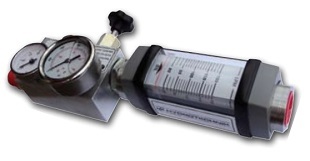 We offer a huge range of analogue hydraulic pressure testing kits that are catered to a wide variety of users. Each kit contains all the necessary equipment, including analogue pressure gauges that are suitable for all test point variants and a large selection of pipe adaptors tailored to suit mostly all hydraulic machines or systems. Our portable pressure kits range stretches from low cost basic kits up to six gauge fixed metal test boxes along with kits tailored to specific test points and pipe work. Choose from BSP, Metric, JIC, ORFS based kits with all common test points and test hoses available such as 1620, 1615, 1215, Steck, HSP and Flat Face Quick Release to name a few. Our hydraulic pressure test kits can be tailored to your specific requirements along with printed logos and contact details as an option. 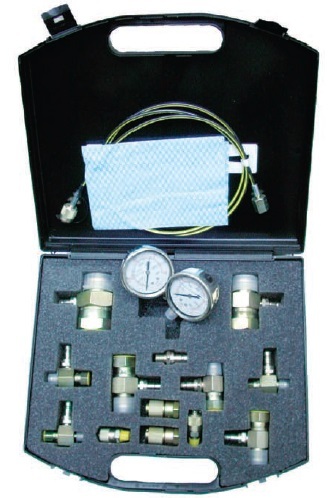 Minimess 1620 Portable Pressure Test Kits for BSP, Metric, JIC & ORFS threads with options for other Minimess and 3rd party test point variants Pressure Test Kits for specific OEM style test points and threads for JCB, Caterpillar, John Deere machines. 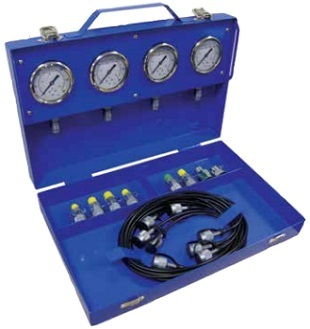 4 or 6 fixed gauge test kits allow for pressure testing of multiple lines or a full range of pressure testing capabilities in one robust kit. Ideal Low Cost Service Tool for economic analogue measurement of Flow, Pressure and Temperature diagnostics with easy to use load valve. 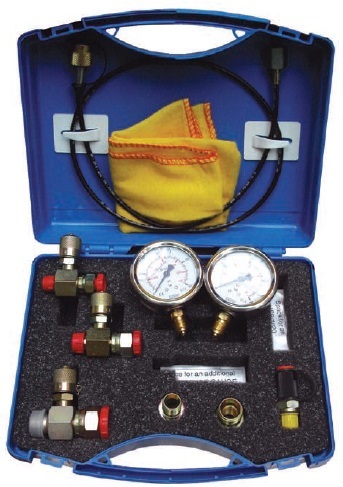 Minimess test point kits JCB & CAT Style Kits Fixed Gauge Metal Boxes Analogue Flow, pressure & temp.